How many SIM registration is done with your NID? (Update 2019)! The number of registered mobile SIM numbers of a Bangladeshi national identity card (NID) registered with mobile phone user can be check at home. To know, a specific code from the mobile phone must be dialed. From now on, any mobile SIM users will be able to know how many SIM registration has been done using their NID. It’s easy and free. If you want, Bangladesh all of the company’s SIM has been registered and you can find out the number of those SIM numbers at free of charge. It is a new method 2019 and can be used to check all SIM users using this method. 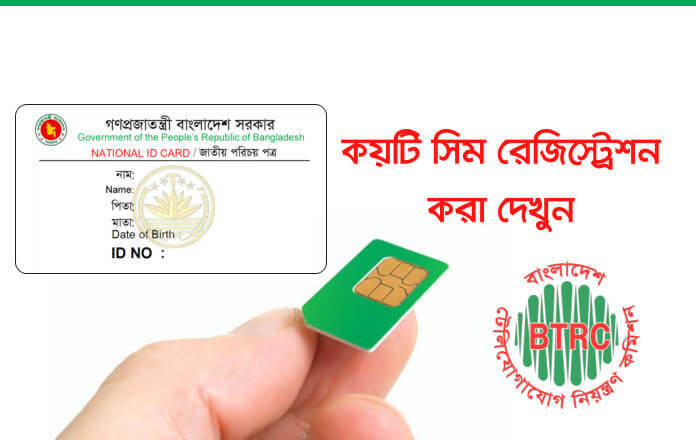 So, do not hesitate to see the SIM’s number registered with your Bangladeshi national identity card. After dialing the code, now Enter the last 4 digits of your NID. Now you received a message and will see the number of your registered national identity card. Thank you, if you have any questions about this article, please comment below to try and answer. Do not forget to share the article, stay connected to social media to get all our post updates. Facebook, Google Plus, Twitter, LinkedIn, Pinterest.